Beeline Britain | One of the Last Great British Adventures……. They did it! On Friday 13th June 2014 the Beeline Britain team completed the first ever straight-line journey from Land’s End to John O’Groats, a total of 1,100km. The Beeline Britain team, which was supported by Prince Harry’s Endeavour Fund, kayaked, cycled, mountain biked and hiked their way across the UK, completing two record breaking sea crossings on route, including the longest open sea kayak crossing in UK waters; 34 hours of non-stop kayaking over 200km. The team of four included a serving RAF Aircrew, a retired Army Captain and Team GB Paralympian, a professional kayak coach and the first Welsh woman to summit Mount Everest. Meet the team here. As The Crow Flies is the award-winning documentary film produced about their journey. Buy, rent or purchase As The Crow Flies DVD here. The journey was completed in 28 days and was reported on in both national and regional press, on radio, television and online. Send a cheque made payable to BLESMA to BLESMA, 185-187 High Road, Chadwell Heath, Romford, Essex, RM6 6NA. Please write ‘Beeline Britain’ on the reverse of the cheque. To view their straight line journey click here. 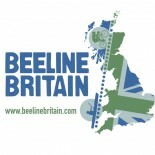 If you’ve searched for “b-line Britain” or “B Line Britain” you’ve come to the right place!! Thanks David, we’re excited too! Wow! What an epic challenge – love it! Good luck Nick, with the training and the event. Tori came to speak at Crickhowell High School last night. She was presenting some D of E awards for us and spoke about her challenges so far and about her upcoming ones. I was inspired to check the Beeline Challenge online and found this site. We all wish you all the best of luck for this challenge, we hope you all have every success with the training, fund raising and the actual challenge. Can’t believe you guys are only a couple of months away from starting this adventure. It was great to meet you on tuesday during your visit to the BCU offices and it was fantastic to hear about the amazing challenge you are all undertaking. As I mentioned Go Canoeing would be really keen to promote your challenge. The timing of your challenge will cross over with National Go Canoeing week and we’d love to do a feature article on your team and what you are doing to help you promote it and give inspiration for others. We have just launched our new website for the week and I thought you might be interested in seeing it: http://www.gocanoeingweek.org.uk/. We’ll be in touch with further information but for now good luck with the training! Yes, Really good to chat the other day. Please keep us updated with any information you have regarding the week and how we can get involved. Nick I worked with you many moons ago with my brother Justin Morgan. I will let him know to sponsor you too. Getting excited now the start is so close. Going to get to Pembrokeshire and then on to North Wales to cheer you all on…………best of luck. Good Luck from the Go Caneoing Team!!! Thanks so much for all your comments, they are keeping the team and our support crew in high spirits. We are following your progress here in Alway House (Christ College). The quiz has just gone up on the board for the kids. Best of luck to you all – I have never stopped to think just how much Kayaking would be involved! from Kathryn Wood Auckland Challenge Inc Coordinator for DOE Hillary Awards. We’ll done team on reaching John O’Groats! We have followed your journey since you visited us in the a Coffee House in Moodiesburn. Is was a real pleasure to meet you all. Congratulations from all the volunteers in the Coffee House. Really enjoyed meeting you at Lybster on your last leg and to see you off up the hill. Sorry to say nothing reported in the Northern Scot, but a good full page article in Monday’s Aberdeen Press & Journal. Hope you hit your fund-raising target – you deserve to!